The steam espresso machine is one of the original types of espresso machines. In fact, the first one was invented in 1884, and while espresso making techniques have expanded since the steam coffee maker came on the market, some people still claim that this original way of making strong coffee drinks is the best. If you’re just venturing into the world of espresso for the first time, this might be a good place to start. Similarly, if you’ve had coffee from a steam espresso machine before and loved it, this option will work well for you. To make espresso, you need to force water through coffee grounds. To get the concentrated taste and aroma of espresso, you’ll only have a little bit of water to use (as opposed to more, in a drip coffee machine). There are several ways of doing this, and one of the most common utilizes steam. Basically, as steam builds up in an enclosed area, pressure builds, too. That pressure can be used to force the water through the coffee grounds. It’s really as easy as that. Some of these steam coffee makers will let you determine what size espresso you want, while others will only make one. All you’ll need to do is add the water, push a button, place your cup, and voila! Espresso. 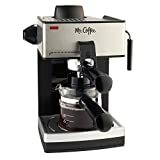 With over 2000 five star reviews this very affordable coffee maker is one of the bestselling steam espresso machines. It brews between 1 and 4 cups of coffee, offering up to 20 ounces of espresso for your drinking enjoyment. It has a decanter with measuring marks, which makes it easier to measure both the water that goes into the machine and how much coffee comes out. This is a very convenient espresso machine. The decanter has a stay-cool handle, to protect your hands even when you want your coffee piping hot. Similarly, the pouring spout is drip-free, so you don’t have to worry about either burns or unsightly coffee stains when getting your drink. It also comes with a cup warmer, which is nice both when preparing your cup for espresso and when you need to step away from your drink for a moment but still want to enjoy it nice and warm. Both the frothing aid and the drip tray are removable, so you can access and clean them as needed without having to move the whole machine. The cord tucks neatly away in cord storage, so you won’t have long tails running across your counter to get hung up on. A measuring scoop also comes with the machine, so you can get the perfect drink every time. DeLonghi is a well-known name in the world of steam coffee makers, and this one will not let you down. It allows you to make two cups of espresso at the same time, using the convenient 2-cup adapter. It’s also a very safe machine, with a safety cap that’s steam-pressurized and an 8.5 ounce glass carafe that’s heat resistant. This machine offers a swivel jet frother, which not only makes a nice, thick froth that’s essential for cappuccinos and lattes, but also allows you to add the froth from many different angles. The power switch for the unit is very simple and has an indicator light, so you can easily see the machine’s current status. It’s also easy to clean, with a removable drip tray that allows you to wash and rinse with ease. This is a very simple, straightforward little steam espresso machine, but it gets the job done. Made by Mr. Coffee, a brand that many people have trusted with their coffee needs over the years, it is almost sure to satisfy. It’s a great choice for people who do not have much space to store an espresso machine, because it only measures 12 x 9 x 14 inches. In addition, it comes with a 1-year limited warranty, just in case something goes wrong. The ECM20 features a 3-way knob that allows you to brew your espresso and make your froth separately. If you like to have that kind of control over the espresso you drink, then this machine is for you. Some users complain that the knob is stiff, though this also makes sure that a bump or a jostle doesn’t mess up your brew. This is also a convenient little steam coffee maker. It comes with a measuring scoop and other tools included, so you don’t have to worry about purchasing them separately. It also has a removable drip tray, making cleanup much easier than units where this comes attached. It’s easy to use and easy to clean, and entirely not overwhelming to the beginner at espresso.